Leading Manufacturer of paraquat dichloride 24% sl (paragreen) and glyphosate 41% sl (glyphogreen) from Vadodara. We are among the leading organisations in the industry for offering an extensive array of Paraquat Dichloride 24% SL (Paragreen) to our esteemed clients. The offered assortment of product is available in a safe packaging. Offered products have very effective and long shelf life features. Additionally, these predominantly control Broad leaf weeds as well as other weeds in the crops of Rice, Wheat, and Tea, Potato, Maize, Grapes, Cotton, Rubber, Apple and also Aquatic weeds. 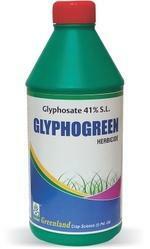 We are providing an excellent quality array of Glyphosate 41% SL (Glyphogreen) to our prestigious clients. Our offered range of these products is demanded by our clients for their right composition and effectiveness. Our offered products are available in various packaging option as per the requirements of our clients. Also, these products are used to treat insecticides and pests of farms and to increase the production capacity of the lands.